Do you need to cook a large breakfast for your family quickly? Or would you just like a secondary skillet to cook two types of dishes at the same time? If the answer is yes to either of these questions, then buying a best rated electric skillet is a good idea. An electric skillet differs from a stovetop version in that when you set it to a desired temperature, it reaches that and stays there better than a stovetop skillet. It also has fewer hotspots, which is common on the latter. Of course, it’s nice to be able to have an alternative heat source when you’re cooking for a party and you can also transport an electric skillet to a campsite or for a potluck if you have to finish a dish just before serving or keep it warm at a buffet. Just remember, these are skillets and not griddles, so although you’ll be able to make such things as pancakes and French toast with them, they may not offer the type of even heating that a griddle does. We have reviewed extra-large griddles too. 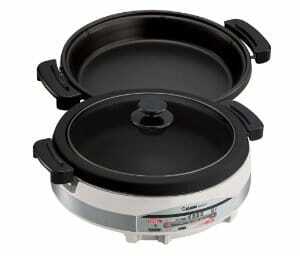 Check out Amazon for a large selection of electric skillets. So, how do you decide on which skillet to buy? You have to ensure that the external heat controls allow for a nice range of temperature. Some skillets will only allow you to set it to high, medium or low and maybe has an additional warm setting, while more expensive ones give you specific temperature settings. If you’re going to use it mostly for breakfast and stir frying, an upper limit of 400°F is enough. However, searing meat or getting a nice crust on something will need at least a 450°F upper limit. For slow cooking, you should be able to set it to a minimum temperature of 200°F and have a keep warm setting, which is usually at around 175F. A lid usually comes with it to help retain heat if you use this for stews and soups. Make sure that it fits well on the skillet and if you intend to transport your dish to a potluck or picnic, look for a locking lid feature. The lid is usually made of glass and the interior cooking surface is most frequently coated with a non-stick layer. You have to consider the size you’ll need. While stovetop skillets come in sizes as small as 8 inches in diameter, that size defeats the point of an electric one. The absolute minimum should be 10 inches in length for a rectangular cooking surface if you cook only small quantities at a time. However, for greater value, consider 14-16 inches in length. This allows you to cook breakfast for several people at a time and is not too large and unwieldy to keep on your counter or fit inside a cabinet. Of course, the frame with temperature controls will increase the size, so take these measurements into account for storage. If you want to use it for soups or stews you’ll need a deep skillet. Not all skillets are dishwasher-safe, so keep that in mind if that is necessary for cleaning. Other nice to have features include an adjustable steam vent to prevent liquid bubbling out, a drainage spout to pour out excess grease, and heat-resistant handles so that you don’t have to use pot holders. Our best electric skillet reviews will help you zero in on the best available models, so read on! These two skillets differ from each other a bit, so make sure you select the right one for your needs. Either way, you’ll be getting the best electric skillet on the market. The Presto 06857 Foldaway is aptly named because the handles fold down and can be detached. This allows the entire unit, including handles, base and cover, to nest inside of itself for a very compact package. That alone means that if you are short on space but you still want a decent sized skillet, you’ll have to seriously consider it. For convenience sake, it has a cast aluminum base for lightness, a non-stick cooking surface, and a built in pouring spout so you can easily pour out grease, oils or gravies, and the skillet, pan and cover are all dishwasher safe. The spout also serves as a spoon holder and prevents condensation from forming inside. The cover is tempered glass and the handles are heat-resistant. It works great as a buffer server as the walls are high enough to hold stews as well. You can also bake cakes or fry French fries in it, making this one of the best rated electric skillet options available today. The Presto 07115 is a 12 inch skillet that also folds down but its surface is non-stick ceramic coated inside and out. Everything else is the same as that of the 16 inch model. The temperature control dial on both the models allows you to go from 400°F to 200°F in increments of 50 degrees. There is also a warm setting. They are both made by Presto, they both have 16-inch cooking surfaces, and they are both non-stick units. Both are far more energy efficient to use than heating up your oven, and they are even priced in the same ball park, so there is no real money advantage into choosing one over the other. But here are some of the differences between the 06857 model above and this Presto 06852 that will decide which skillet is right for you. The Presto 06852 is not a folding model, but it makes up for that in the unique art deco-like handle design. It will be a bit tougher to store, but you may not want to because this is a very handsome looking skillet. It has a cast aluminum base for lightness, you can use it as server to keep things warm in, and perhaps best of all, this is an electric skillet with a removable pan, so you can put it into your dishwasher. If you value ease of cleaning overall, then this is also a good skillet for you. The De’Longhi BG45 is a 15-inch skillet, so you’ll lose a few inches over the 16-inch models listed above, but it heats a bit more evenly, so if you are looking for a unit that is capable of making evenly cooked pancakes and French toast, this would be a good choice. The base is aluminium, and because it is a hair smaller, it is also a bit lighter in weight too. The base and cover are dishwasher safe, so there won’t be many cleaning hassles with this unit either. The most unique feature here are the built-in steam venting holes around the handle. You can open or close them to vent steam, which makes it nice to control the cooking process depending on the kind of foods you cook. Although possibly a flaw, there have been some concerns about the non-stick coating beginning to peel and flake after very often and repeated use. Of course no one will ever know if metal utensils were used, which would scratch the surface and potentially cause peeling, but that problem must be noted so you can make the best decision possible when looking for a new skillet. The top temperature that this skillet goes to is 400 degrees. This may be listed as an 11-inch skillet, and while that’s true of the flat cooking surface, the high domed cover of the Presto 06620 will allow you to actually cook more substantial foods inside, like a chicken or pork roast. That makes this little skillet very versatile. Once again, however, after repeated and heavy usage, the non-stick coating may begin to peel. But you’ll have to take that with a grain of salt because any abuse from metal utensils will scratch the coating and afterwards, potentially cause this problem. And realistically, that would happen to virtually any non-stick surface coating. The smaller size lends itself to being a wonderful appliance for smaller areas, like an RV or a student dorm, it heats quicker and it takes less space to store when the cooking is done. Just don’t expect to cook family sized meals here. It is best suited for two to four people, and when used for that situation, it is in its element. If cost is no object for you, then you might want to consider this Zojirushi EP-RAC50 Skillet. It is big and round, at a bit over 14 inches, and will definitely accommodate enough food for a family. You might think that if you are paying this type of price for a skillet, and at three times the cost of the Prestos listed above it is high priced for sure, that this would be a perfect electric skillet. And although it may be the most even heating unit of the bunch, and it has the most precise temperature control, it does have its share of quirks. For one thing, the cooking surface is slanted towards the outside, so if you are using oil, you’ll need to use more to keep the middle of the skillet covered. For another thing, it won’t go in your dishwasher, and finally, during storage, it needs to be stacked a certain way, or you might dent or break parts. You’ll have to use care when stirring or flipping things to keep the non-stick titanium ceramic surface scratch-free, but there is no Teflon here, so it’s a safer choice than the others above. However, if you can get around these little annoyances, you’ll be getting a skillet that comes with two cooking surfaces, a deep pan for regular cooking, and a flat plate griddle for pancakes, burgers and steaks. You also get an adjustable height steaming rack. Because of that versatility, no one will ever say that this is not one darn fine skillet as it is. This is the top rated electric skillet for high temperature cooking, as it goes from 280F to 480F and has a warm setting as well, so searing steaks and frying burgers is no problem with this unit. If you want, potentially, the healthiest skillet to cook with, then the Cuisinart CSK-250 Green Gourmet should be your choice. That it’s a terrific skillet on its own, can’t be denied, but what makes it stand out from the rest is the non-stick cooking surface. The Green Gourmet surface is made of a ceramic compound that has no PTFE and PTOA– which are essentially Teflon-based chemicals — and it doesn’t use any petroleum distillates in the manufacture of the non-stick surface either. That means there is never any worry about potentially unhealthy chemicals leaching into your food during cooking. And really, we should all take that into consideration. It’s a round 14-inch design skillet, which heats quickly and holds temperature well. Its temperature range goes from 250F to 450F with a warm setting. Because you don’t have to worry about leaching chemicals, you can turn up the heat and fry things without any concern. Its handles and lid grip are made of die-cast stainless steel so yo’ll need to use pot holders while handling it. Yes, this is not an inexpensive unit, and always remember to use non-metal utensils or you’ll scratch the surface. It has a vent hole to get rid of steam, but if you are making something that requires a high liquid content, the steam will condense on the inner lid and may escape out the sides. But for anything else, you’ll be good to go. ← What is the Best Spiralizer to Buy?